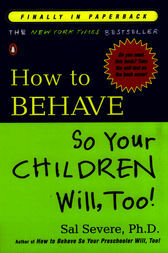 Title: How to Behave So Your Children Will, Too! Dr. Sal Severe has been a school psychologist for more than twenty-five years. He serves on the advisory board of Parents magazine and is a member of the National Association of School Psychologists. Dr. Severe is also the author of How to Behave So Your Preschooler Will, Too!